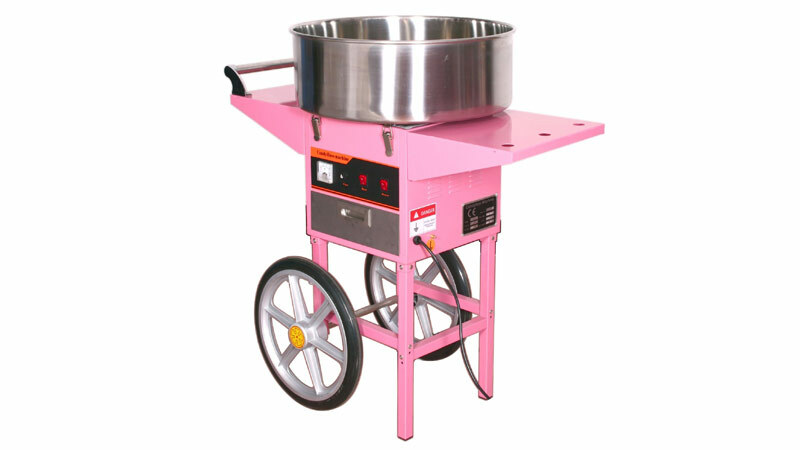 The VIVO Candy Floss Maker Pink Cart is the idea mobile Cotton Candy Maker. It is so easy to use, you simply plug it in, allow a few minutes for it to heat up, and you are ready to go. It is ideal for home or commercial use and can produce 2-3 servings of cotton candy in one minute. Once turned on, it takes about 5 minutes to warm up. When the machine is warm, pour in the sugar and it will start producing beautiful, woolly cotton candy. Use cones to collect the spun sugar strands above the bowl. With the VIVO cotton candy maker, you can use both floss sugar and hard candies to create a variety of flavored cotton candy. If you plan to use this machine outdoors, we recommend picking up a clear bubble shield that goes over top of the stainless steel bowl. This helps keep the cotton candy contained while you collect it and avoids strands from flying out and stickying up surfaces around you. This is a wonderful and magical appliance to own. Have your paper cones ready and lined up before the machine starts as it produces cotton candy at a rate and to avoid build up in the bowl, you want to collect continuously. If you are using the machine indoors, you may notice a bit of sweet smelling cotton candy smoke so leave windows open to allow for ventilation. This is perfectly normal. For this brilliant machine, we highly recommend investing in the Clear Bubble Cover Shield. This is an absolute must. When using the cotton candy machine outdoors and in windy conditions, the shield prevents sugar crystals from flying into the air and drastically cuts down on any mess. Use it indoors too to avoid sticky surfaces near the machine. It also keeps excited little fingers from getting burned or damaging the spinning head. The clear bubble shield fits perfectly on the VIVO CANDY-V001 & V002 cotton candy machines. The bubble is made out of a durable clear plastic and fits the bowl snugly and does not rattle or make noise.